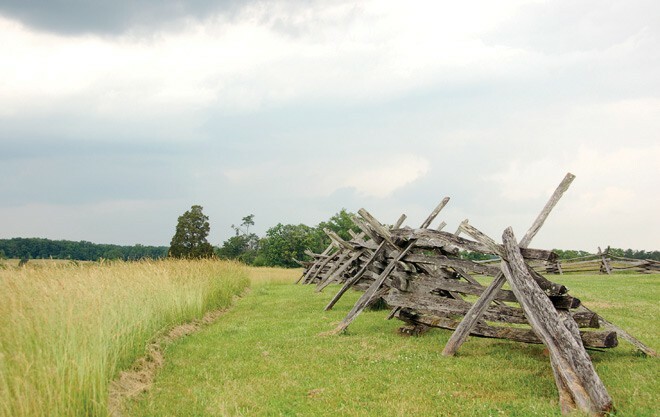 In 1860, one year before Confederate and Union armies collided for the First Battle of Bull Run, the rolling country meadows that one day would become Manassas National Battlefield Park saw an invasion of a very different kind. Swarms of cicadas (genus Magicicada) made their appearance, as they do just once every 17 years, filling the countryside with their noisy song and bumbling flight. A 17-year Brood II cicada at Manassas Battlefield Park. Photo © Todd Christopher/NPCA. Today, nine generations later, the periodical cicadas known as Brood II are at it again, emerging by the millions in locations from North Carolina to Connecticut. But while this army of insects brings plenty of sound, there’s little fury; the harmless creatures don’t bite or sting, though the less-than-elegant fliers might accidentally land on you. They simply spend their brief adult lives looking for mates, making quite a racket and raising a fuss in the process. Manassas Battlefield Park. Photo © Todd Christopher. As a resident of the Washington, D.C., area, I clearly remember the region’s last big emergence of cicadas, the 2004 swarming of Brood X across much of the East Coast. At the time, I was the father of a newborn and a three-year-old who happily collected live cicadas by the bucketful for closer inspection. I was excited to experience the arrival of this new brood with my children, now that they were both old enough to appreciate them on a different level. After all, the mass emergence of periodical cicadas is one of nature’s most remarkable—and puzzling—phenomena. After 17 years underground, drawing nourishment from the roots of trees and plants, a cicada brood slowly moves toward the surface and waits. When the soil temperature reaches 64 degrees Fahrenheit, the nymphs burrow upward as one under cover of night, breaking the surface and climbing up the sides of trees. There, they cling on for dear life as they break out of their skins, unfurl their wings and complete the transformation from soft, white shrimp-like nymphs into dark, hard-shelled adult cicadas—who then take to the skies and treetops in often staggering numbers, the males calling in choruses that can top 100 decibels. It’s a pretty spectacular show. 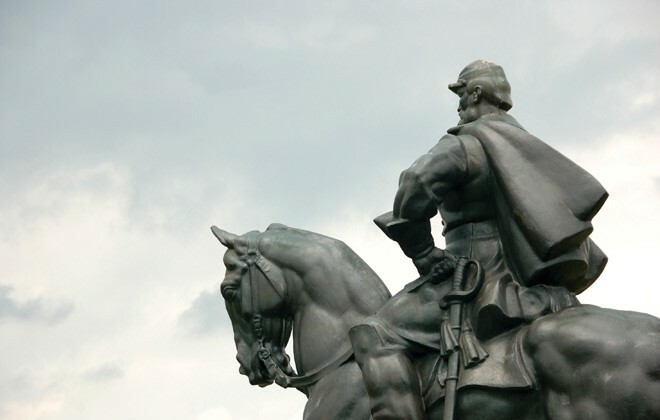 The Stonewall Jackson statue at Manassas Battlefield Park. Photo © Todd Christopher. But for many of us in Washington’s western suburbs, Brood II turned out to be–depending on your point of view–either a bust or a reprieve. It seemed that in areas that were crawling with cicadas in 2004, there was nary a peep to be heard. Fortunately, we weren’t that far off. Just 25 miles west of the Capital Beltway, Brood II was in full bloom at Manassas National Battlefield Park, the northeastern-most edge of a swath of activity extending west to Shenandoah National Park and south toward the North Carolina border. It was a perfect setting for a visit. Buzzing lazily over the tall grass meadows or clinging by the hundreds to the bark and leaves of the trees, the cicadas brought a different kind of life to the battlefield. The resounding chorus rang out steadily from the treetops, providing ethereal, almost ghostly background music to the scene. And over the course of the afternoon, we got to appreciate these curious creatures up close, like old friends we hadn’t seen in a very long time. If you haven’t seen them yet, there’s still time—but not much. Over the next few weeks, the adult cicadas of Brood II will fade away, and their offspring will burrow underground to begin their long, patient 17-year wait before emerging from the ground and beginning the cycle anew. Want to see where the cicadas have been—and will be? Check out this interactive feature from the New York Times.